Default options shown above. Upgrades are available. NO DRILLING THROUGH TOWER REQUIRED!!! Built in mounts to quickly accept our Razor Series rack line with 1 simple stainless steel fastener. Front legs remove easily once the tower is laid down so the tower can fit into your garage while still attached to the boat. Big Air Fusion Wake Tower can be laid down and the front legs removed in less than 1 minute. Swivel Joint attachments on the base plates prevent stress cracking to your boats fiberglass. Many towers use a rigid mount, that delivers stress and flexure directly into your boats hull. This causes cracking and fatigue of the fiberglass. Our unique swivel system keeps the stress and flexure where it belongs, IN the tower. Big Air Fusion Towers are made to fit nearly all boats, fitting any boat with a beam width from 58" to 103"
Tower stands 5' alone. Designed to have an approximate height of 7' 3" depending on boat style. Our towers are also great for barefoot skiing. 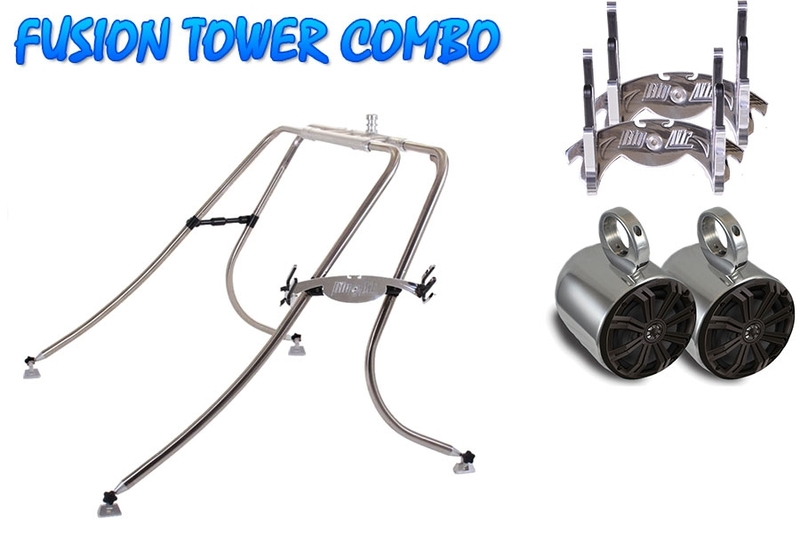 Our tower is great for long line work with either frontwards skiing or backwards skiing. The same benefits derived by wakeboarders (the upward pull) really helps out in barefooting as well.